The concept of 'spiral protein bread' may seem strange. Let me explain how I arrived at it. As a vegan, I sometimes have to think a little further about how to get protein into my diet. (Non-vegans out there, don't jump to conclusions!- there are numerous easy vegan protein sources). Now then, I love bread. I really do. Putting two and two together, I started my mission to find a way to get some decent protein into my bread. Unfortunately, the recipes already out there are pretty unsatisfactory. The non-vegan ones just add eggs, which rings more of a cake than a bread to me. The vegan ones often add protein powder, which seems like cheating, and isn't great for the flavour. I've also found a recipe adding quinoa which doesn't belong anywhere near bread as far as I'm concerned. So I've taken a three-pronged approach to getting that extra bit of protein in. First and foremost, roughly a quarter of the flour I've used is vital wheat gluten. This is a flour consisting of milled wheat-berry endosperm: the part of the grain that contains the protein. Vital wheat gluten is commonly used for its binding ability in baking, its high protein content and its chewy texture in meat substitutes, like seitan, the centuries-old meat substitute of East-Asian Buddhist origin. My second tactic is using unsweetened soy milk for nearly half of the water. This adds a touch of protein without changing the flavour at all. And the third prong would be the seeds. Chia seeds are remarkably high in protein (21%) while I added flax seeds (18% protein) for variation and also their excellent health-giving properties in general. So, here is a bread that has 21g protein per 100g, meaning in an average 50g slice you'll get a whopping 10.5g of protein. If you have a look at the nutritional values of most other bread, they tend to be in the region of 8-11g protein/100g meaning this loaf has effectively double! Because I like to know this kind of thing, and as you can probably tell am fairly pedantic(! 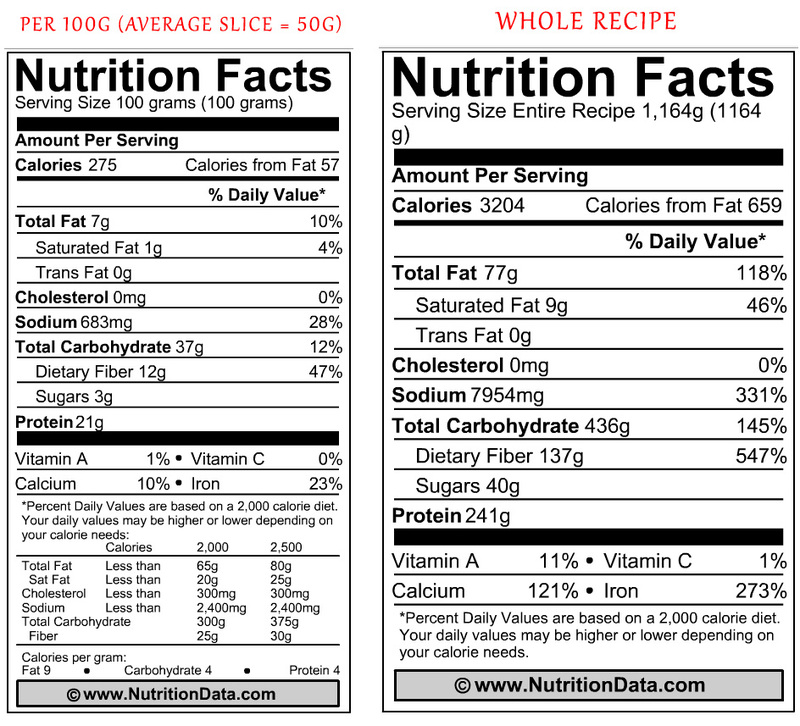 ), I've calculated the nutritional information for you guys, too. Find it here :). So why a spiral? 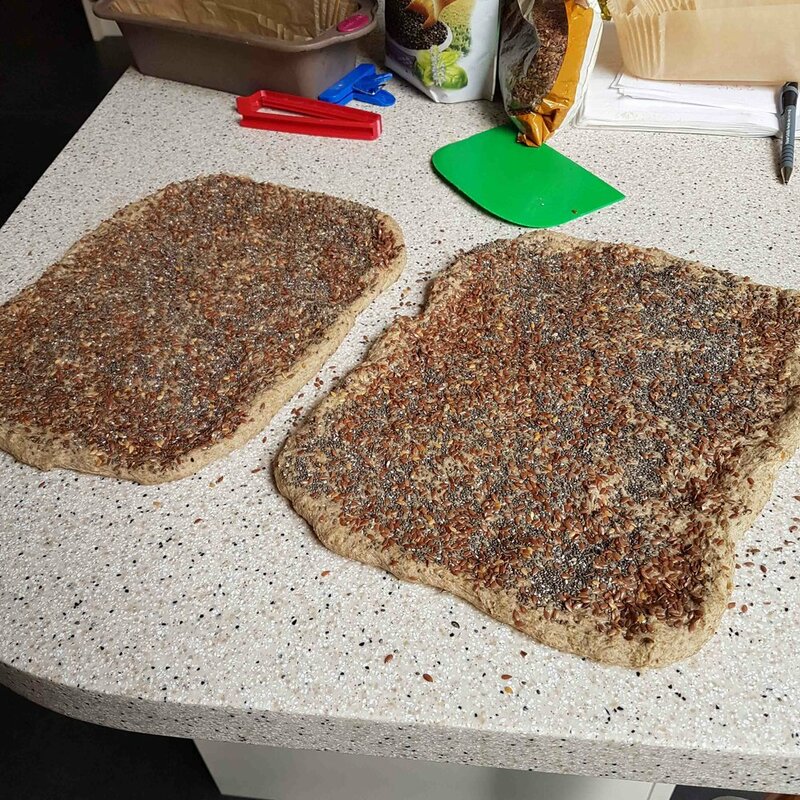 The easiest method to mix seeds into a dough is usually to flatten the dough into a rectangle, sprinkle them over evenly, and then give it a thorough knead to distribute them evenly. Staring at the seeds all nicely laid out, I thought 'no way am I ruining this', and proceeded to tightly roll it up, Chelsea bun-style. What results is a lovely spiral pattern of seeds once you slice into the loaf, rather than the tiny chia seeds getting dispersed and somewhat lost. This step is absolutely optional, and for ease you can leave it out, but it adds intrigue to the bread, like you've created something really special. Bread-heads out there may be wondering if it affects the final rise and shape of the dough. I've run this test, too, and it seems the spiral formation does affect the rise, but not detrimentally: it just makes the dough rise more evenly than gaining an inflated bump in the middle. More protein must equal less of something, right? Yes. There are fewer carbohydrates in the bread which may come in handy for those on a low-carb diet. What's more, I was recently astonished to find less than 3% of Americans get the recommended minimum intake of fibre. So you'll be pleased to hear this bread has a great amount of fibre (12g/100g) from the wholegrain rye and wheat flours. But does it taste good? It's all well and good if a food is very healthy, but that's no help if it isn't tasty enough to eat! So I've actually worked hard to extract as much flavour from the ingredients as possible. In my first couple of attempts I mixed the ingredients using an all-in-one method, which produced a bread with a nice texture but just a little lacking in flavour. However, my recent tests have been much more successful in that department. 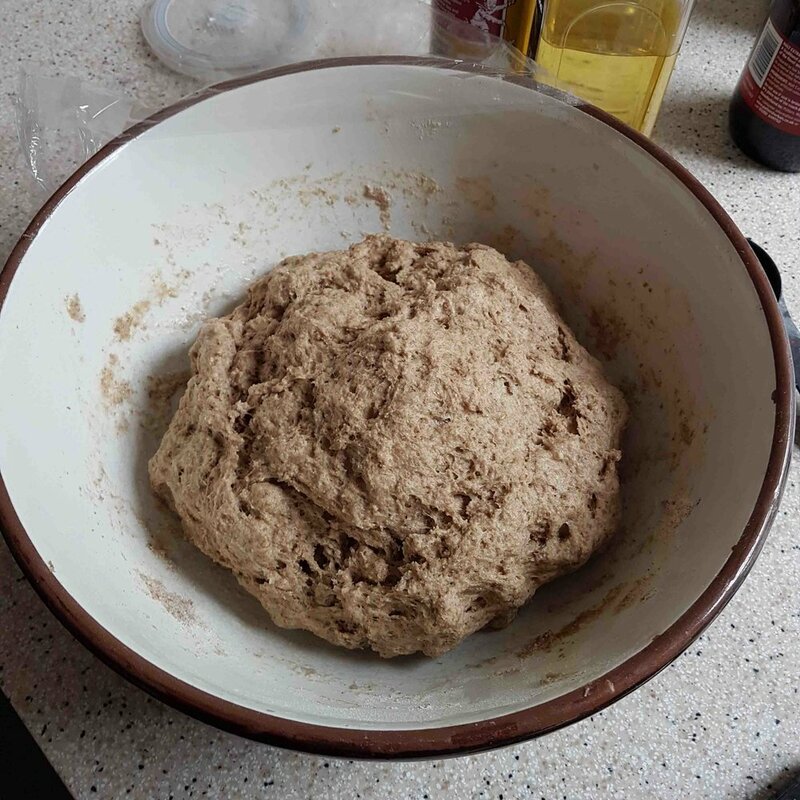 I've used the sponge method of mixing which involves combining some of the flour, water and all of the yeast the night before you want to bake. This allows the enzymes in the yeast time to break down the carbohydrates in the flour and give off alcohol, which subsequently turns into acid and combines to produce esters, the aromatic molecules responsible for most of the flavour in bread! Put simply, bread that ferments for longer will taste better. This method is undeniably better than mixing bread dough all at once and baking the same day, reliably producing better tasting bread without the addition of any extra ingredients (such as fat or sugar; the commercial world's way of quickly producing flavourful bread). If you've read this far, I commend you, dedicated reader. You've given me the chance to nerd-out about this bread stuff and I thank you for it. Believe it or not, my background is in bread, having spent time in two bakeries, and to this day it is still probably what I am most knowledgeable about, despite moving my main focus to... random bowls of vegan food. See below the recipe instructions for optional substitutions. The night before you want to bake the bread, thoroughly combine the first five ingredients in a large mixing bowl. Cover this with cling film and leave out overnight. The next morning, add all of the remaining ingredients to last night's mixture, except for the seeds. Using your hands, or with an electric stand mixer, mix this thoroughly until a cohesive dough has formed. Add a tiny amount of water if you need to. Cover again with cling film and leave to rise for 2 hours. Flatten the dough and give it a small knead to redistribute the yeast. Re-cover with cling film and leave again for 2-3 hours. 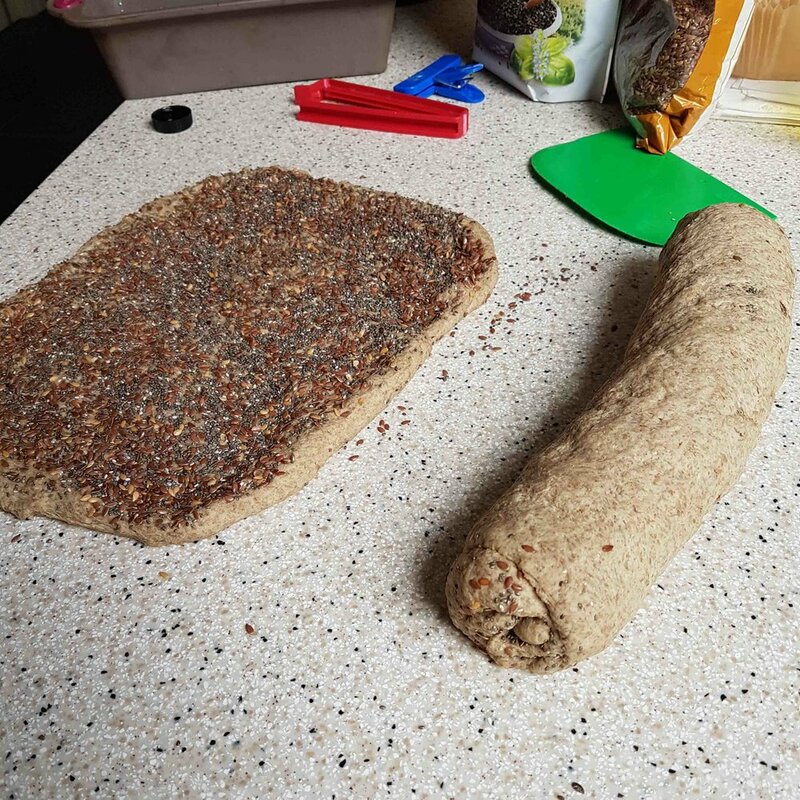 To shape the dough and incorporate the seeds, cut the dough in half and flatten each half into roughly a 30cm x 20cm (12" x 8") rectangle. Pour half of the chia seeds onto one half and the rest onto the other half. Do the same with the linseeds. Firmly press the seeds into the dough so that they stick. Roll the dough up, rolling from top to bottom along a short edge. Tuck the dough in underneath the roll as you go. Press down as you go, too, so it is tightly rolled. Pinch to seal at the end. Put both rolled doughs into two oiled 30cm x 13cm x 7cm (12" x 5" x 3") loaf tins. Spray (or brush) the tops of the dough with oil and cover loosely with cling film. Leave for the final rise for 2 ½ hours. After 2 hours have passed, preheat the oven to 200°C/390°F. When the 2½ hours are up, remove the cling film from the loaves. Using a bread knife, gently slash the tops of each loaf in 3 places, diagonally. Bake the loaves for 15 minutes, then cover loosely with foil to stop the top from burning. Turn the oven down to 180°C/355°F and bake for 45 minutes more. Check the bread is done by taking it out of the tin (careful - hot!) and tapping the bottom. You should hear a hollow sound. Leave to cool for 10 minutes back in the tin, then remove and leave to cool on a wire rack. This bread can be frozen if desired. It makes fantastic toast. Barley malt syrup: black treacle or blackstrap molasses could also be used here. Maple or agave syrup can be used, too, but are less preferable. Flax/chia seeds: any relatively small seed can work. Sesame or poppy would be good, but they aren't as high in protein as chia. Dark rye flour: any wholemeal flour would work, as the structure of the bread comes from the vital wheat gluten. So it doesn't have to be strong bread flour. Thus, wholegrain spelt, buckwheat and regular wholemeal wheat flour would all work well. Wholemeal bread flour: the same substitutions apply to this as to the dark rye flour above. Soy milk: other unsweetened non-dairy milks are not ideal as they tend to be low in protein. If you're not vegan, dairy milk would work here, but may change the flavour of the bread. N.B. this post contains an affiliated link for the vital wheat gluten. Meaning you will support this page if you purchase through that link!